Leading Manufacturer of gas cells and gas cells type b from Thane. Pioneers in the industry, we are offering an excellent range of Gas Cells that are offered to the spectroscopist for the purpose of studying infrared gas in an inexpensive manner. This gas cell is designed utilizing quality approved components & latest technology as per the set standards of market. 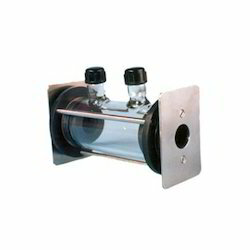 We offer this gas cell on several specifications as per the needs of the patrons. Our gas cell can be availed in large quantity within a given time-frame with quality packaging. Being one of the reputed organizations in the market, we are engaged in offering an exclusive array of Gas Cells that are utilized at both decreased and increased pressure. This gas cell is developed from superior grade components as per the set industry standards under the direction of experts. The offered gas cell is accessible in different specifications to meet the requirements of customers. As well, our valued customers can avail this gas cell from us at reasonable rates in a given time period.